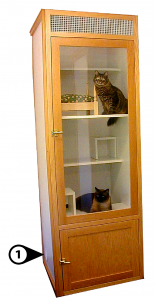 Standing 7 feet, 7 inches in height, the melamine and wood time cat condo from The Cat’s Inn is a great solution for your cat boarding needs. Available in your choice of oak or maple, each unit includes six levels for cats to explore, including a secluded bottom floor for the litter box and a place to hide away from prying eyes. Each condo has 28 square feet of living space and the front panel of tempered glass gives cats an open look at their surroundings, with the elevated top level giving them the high ground to get the best view. 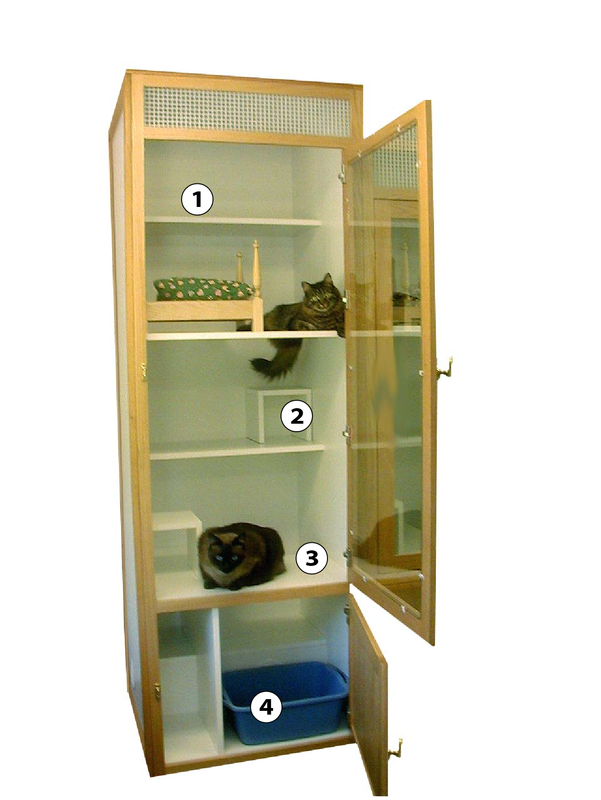 Built-in steps make it easy for kittens and elder cats to maneuver from level to level, while the large open spaces give cats room to nap, lounge or play. Ventilation ducts are located along the bottom that can be arranged side by side with other condos to create a unified, patented ventilation system (No. 6,318,295 b1) to prevent odors and airborne diseases from spreading. Each unit is also further customizable with glass back panels, tinted glass and pass-through doors between units, and accessories are available, including The Cat’s Inn four-post cat bed with washable mattress – available in oak, cherry or maple. To learn more or to receive a quote, contact The Cat’s Inn today by calling 877-228-7466. Ventilation duct outlets are located on each side of the townhouse. When placed side by side, this creates one ventilation passage to remove air borne diseases and odor. 4 Poster bed in oak, cherry or maple with washable mattress – view more info on our cat beds.